Adriano has over 40 years of experience hand making garments. He can create suits that fit all body types perfectly. This Blog is a reflection of Adriano’s ideas, thoughts, design, achievements coupled with general information and updates, about the business. 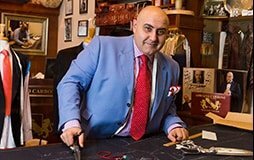 The journey from plain cloth to an exquisitely finished male or female garment becomes reality as Adriano shares his passion for tailor made clothing. Please join the conversation and add your comments as we transcend into the realms of master tailoring and high end fashion. Adriano Carbone Master Tailor provides his customers with not only a quality garment of their choice but also an experience, to match. This is shown by the repeat clients that frequent this Melbourne Fashion Establishment and underlies the importance of both his personal skills and accuracy.